Over the past two years, I have worked micro plastics into my arsenal pretty heavily. The majority of the time that I am on the ice I am running a plastic of some kind. Sometimes it is tipped with a maggot for an attractive meat scent but I would rather not do this because it takes away from the action. As with anything fishing related, what works one day may not work the next. A common mistake I make and see others doing is getting confidence in one specific set up and not changing it when the bite slows. Don’t let this happen to you! There are several things to consider when choosing what plastic to use. Micro plastics represent their name well because they tend to have a small profile in the water but certain baits, because of their shapes, can move a lot of water. The more movement on your bait the better chance that you will trigger a fishes sensory organs. If I know that there are large fish where I am fishing but lots of aggressive smaller fish, I will use a larger bait to help weed out some smaller ones. In general, I like to go as small as possible to make it look as realistic as I can as most of the meals that panfish feed on during the winter months are tiny. The first thing to consider is what bait to put on. They come in all shapes and sizes. Personally, I find myself using baits that have two or more tails more frequently than a straight tail. I like that they have more surface area moving. The exception to this is when I am fishing in an area that is predominately composed of pumpinseeds. Being that their mouths are so small, I select baits that are compact. This way they can inhale it easily enough to get the hook in their mouth. When fishing for fish that can handle a larger bait, I like to scale up my presentation as much as possible. The more moving parts the better. From past experiences sight fishing, I have seen a lot of fish hit my jigs from the side or even the head. When there are tentacles pulsating off the side it attracts the fish and entices them to bite more readily rather than just blowing on it. The next thing to consider is color. I like to contrast my colors of jig and plastic but I will point you in a different direction for the bulk of the info. There is an article on page 44 in ODU Magazine that was written by Scott Brauer, the founder of Maki Plastics, on color selection throughout winter. Its a good read that will get you started by a man who knows his stuff (also, read the rest of the magazine and sign up for their release notifications!). I have pictured some of his products below. The final thing to think about is how to rig the plastic. If I am fishing high in the water column for suspended crappie, I like to have the bait dangling so that they feed up into it. When I am fishing more towards the bottom, I like to try to have the bait point up towards the ice in hopes that the fish are searching the bottom for a snail or a bloodworm. You can also rig them “whacky” (bass term for hooking it through the middle) which will give the bait a very good flapping action. You can give these rigs quite a few different actions. Experiment with the bait in the hole before you drop it down to make sure that the action looks good and see how it reacts when you jig it different ways. You can can pound it, twitch it, try to hold it still, deadstick it, or raise and drop it. All methods have their own place and time. Don’t be afraid to mix them all up until you find a technique that works for the day. The last few days on the water were windy. I basically tried to hold the bait still and let the wind do the movement as it blew across my line. I detected my bites by watching for movement in the line. When the fishing is on its a drag to have to rebait. Plastics make it possible to pull more fish out of a moving school than would be possible with live bait. Most times I just adjust how my plastic is set on the hook and toss it back down. On several occasions this winter I have caught over 40 crappies on one plastic before I had to retire it. The best day was 57! I will say that they don’t stand up so well if you are catching bass or pike. They tend to rip them up pretty easily. Now a bit about options for tackle. In my box I keep several styles that are produced by two companies. The first company I will mention is J and S Custom Jigs. They have two styles baits that I have had a great deal of success with. 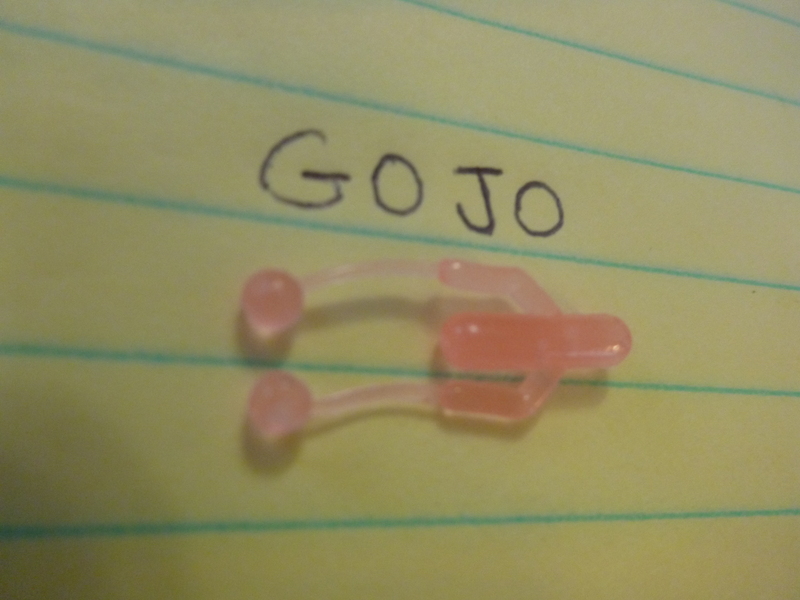 The first is the “Gojo.” This bait fits my fishing style because it has multiple moving parts and the quivering action is dynamite! The thing I like about this bait is the plastic balls on the ends of the legs seem to float when put in the water. It slows the fall rate greatly. Usually fishing that bait, I find that the fish take the balls off pretty quickly as that is what they grab for first. It doesn’t change the quality of it fishes though! My favorite color in the Gojo is the clear blue glitter. 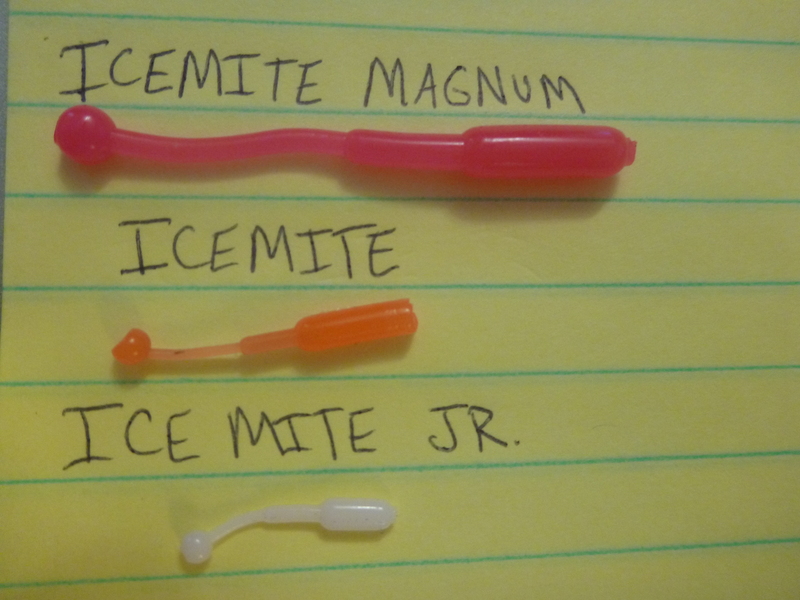 The “IceMite” series is a bait also made by J and S. These baits work wonders on pumkinseed and aggressive crappie. One huge benefit to this bait is the multiple sizes of identical shapes. When I start catching smaller fish I move up to the next size. Usually my catch rate decreases but my quality rate is increased dramatically. These baits come in 20 different colors so it isn’t usually much of a hassle to match the hatch! My favorite color for all three of these plastics is pink. The other company that makes a quality plastic is Maki Plastics. These baits are great when the fish have a very specific search image (or really any day). The baits are very detailed and were created to replicate actual larvae pulled from the water or stomach contents. You can fish them as they are or modify the baits by pinching off a section of the body to fish just the parts that you want. 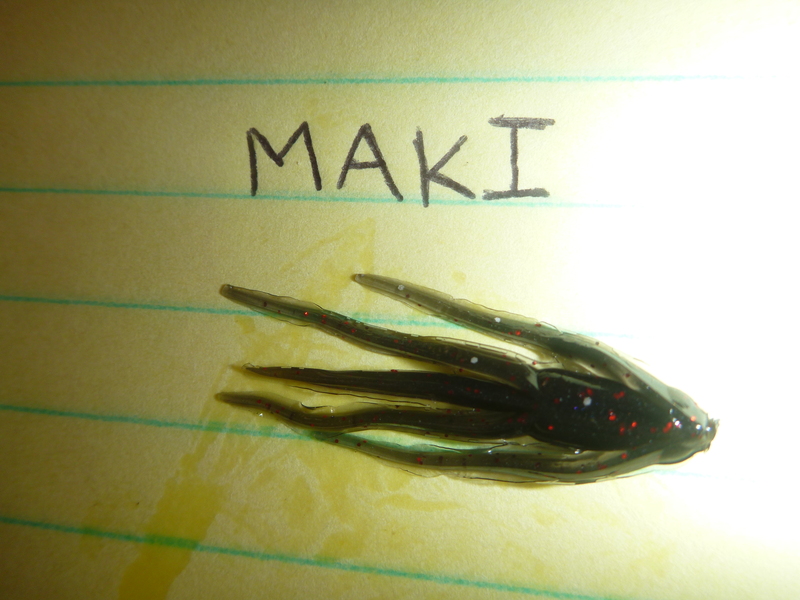 The bait below is the “Maki” and is what started it all. It is killer for all species of fish but the perch absolutely love it. I fish it on vertical and horizontal jigs alike. My go to colors are white, hot pink, and black. 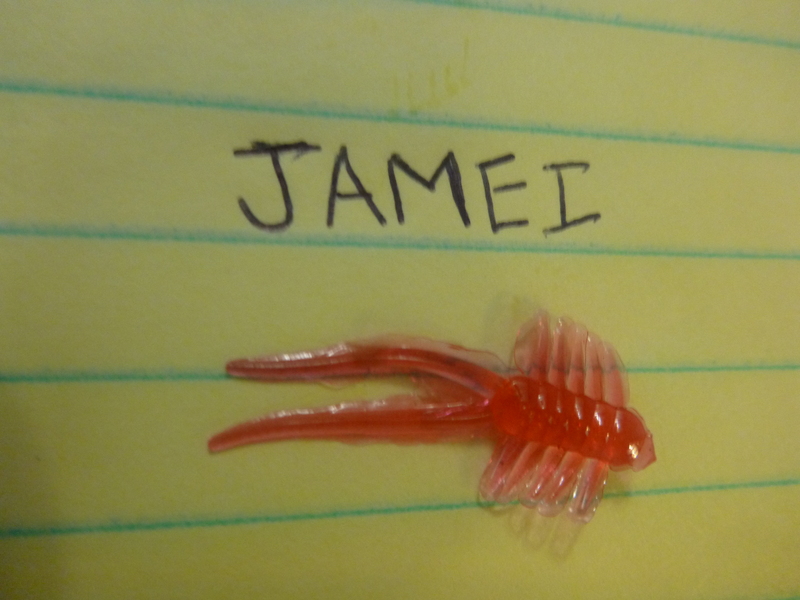 Probably my most used bait by Maki is the “jamei.” This bait was designed by James Vladyka of Fish Hounds Outdoors to entice the tight lipped panfish on the Connecticut River when the water is low. I have had this bait working hard for me since I got my first package! The action is great and its super compact. The tails drive the fish nuts! 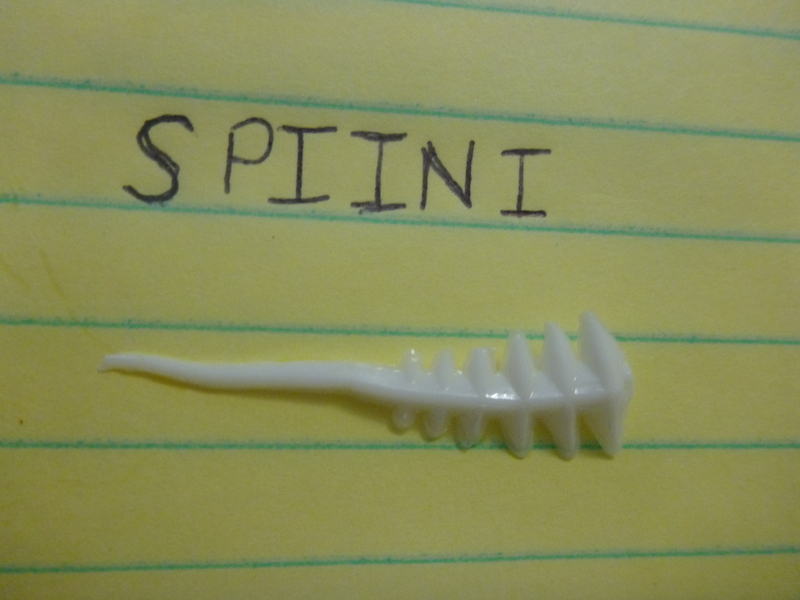 I’ve had very good luck using the “Spiini” in deep water crappie situations when the fish are suspending. At the glory hole, there are lots of smaller fish around that will eat anything you drop before a big one has a chance to move in… This bait helps a bit to weed out some of the smaller ones. White and red have worked great this season so far. By no means do I claim to be an expert on how to select plastics for a given day but the more I use them the more I learn. I know to be patient with my presentation but that I can waste a lot of time if I don’t get proactive and search for fish and give them what they want. I have used my camera numerous times to see how a fish reacts to my jig and its a great technique. No matter how many times I fish I always get something out of it! Don’t forget to put these baits in your pocket when they are no longer fishable… Lets try to be stewards of the ice! i read your post daily , they are well written and make for good reading .You guy’s are doing a great job a ton of info for those that don’t have the info. I look forward to reading it keep it up . This might upset Scott but i get more out of your blog than the forum. Thanks Dody – You guys have helped us out a lot this season to get on fish. Look forward to fishing with you soon! I agree with Dody, the forum has gone rather quiet , not much being shared there except for Dylans journal. Keep up with this blog, I enjoy it and just learned about some different plastic to fish with. Well we appreciate that dave, the forum is still a great tool when everyone is sharing.